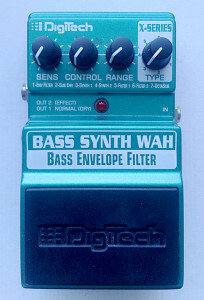 Digitech XBW Bass Synth Wah, Bass envelope filter from X-series. Made in china around mid-00’s. Ok. I’ve had some of the X-series boxes lying around for quite some time. Just didn’t find it in me to open them up until now. All them sounded and felt reasonable good on initial tests, so i just took the stance of “decent, not great, but decent” and left them be. Now i figured i would finally start checking them through. XBW is a good unit to start with. Good features and there is some notable usability in there. Sure this isn’t meant to compete with Boss SYB-3/SYB-5 with its lower price point and slightly smaller feature set. I haven’t seen schematics for any of the X-series boxes around. Opening the bottom plate gives a clue for why. There are vias like drops in the ocean. 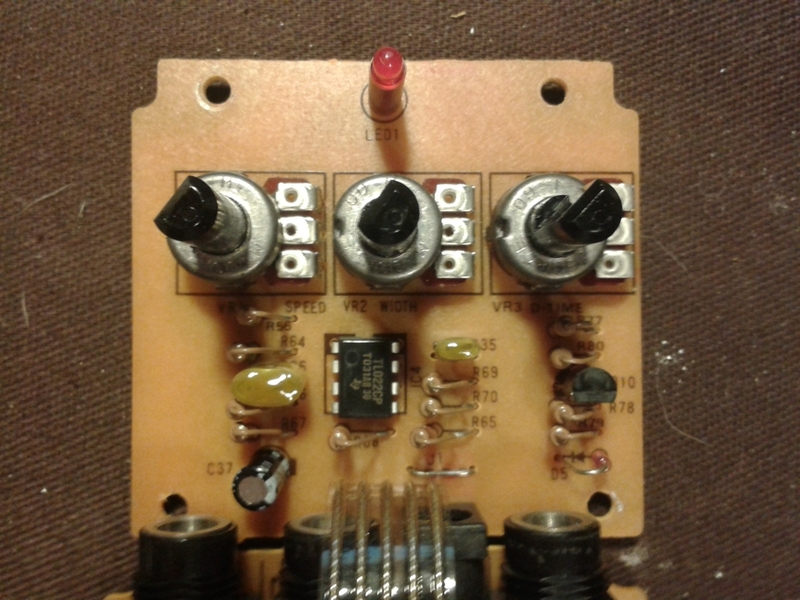 For starters, super dull, auto-routed board design is quite off-putting. Next, the brand is called Digitech. Which made me slightly cautious and suspicious, since the Distortion series is all analog and has roots deep in the old DOD catalogue. Flipping the board over shows what’s really going on. 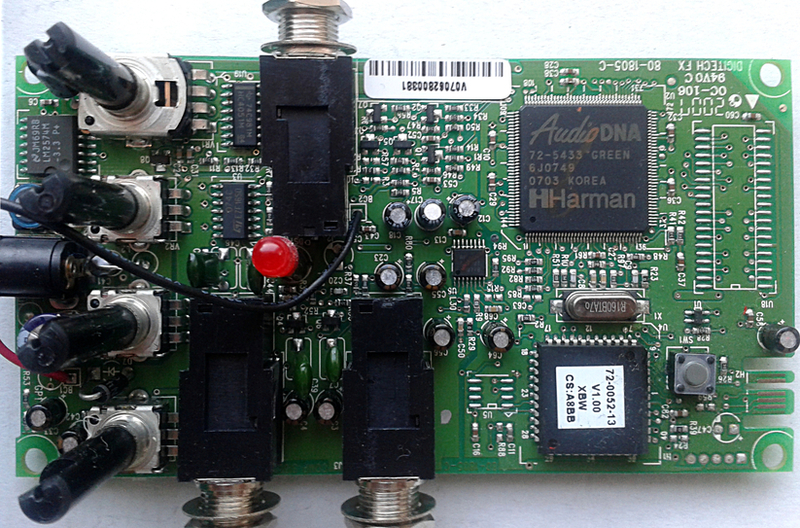 Harman (the mother company of Digitech) branded AudioDNA digital signal processor with crystal oscillator and a ROM. Now this is what the digital effects are made of. Don’t have to see the schematic to tell you that there is analog signal path with buffers ann switching, followed by AD/DA conversion and another set of buffers and switching components. The effect is in the slash between AD/DA. This made me worry a little. Could it be that Digitech X-series is as boring designwise as post-2005 Boss pedals? This meaning that the circuitry is exactly the same on all boxes, just with different digital control for each and different code in the ROM chips. Nothing too wrong with that. It’s just that my interest about the X-series boxes just got stomped even deeper in to the ground. Like a working “bass synthesizer” pedal. To get a picture, we need to compare it to something we already know. 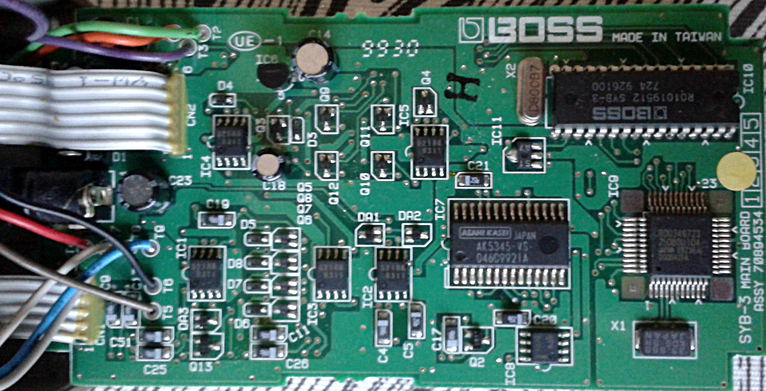 Boss SYB-3 is well more feature packed and wilder in its sounds. Same thing goes for Ibanez SB7. I’d say the synth sweeps here are duller than the competition, but there isn’t that much negative to the sound. More boring than the competition, but still a decent entry level bass synth/autowah unit. For the price and your home recording applications – i’d say this will suffice. Works and sounds pretty good on guitar too. Leaves me baffled, but still trusting. 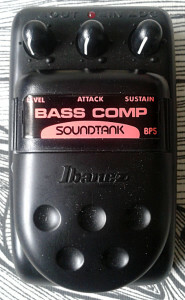 Ibanez BP5 Bass Comp compressor from the Soundtank series. Made in taiwan around mid 90’s. Who would have thought that BP5 was the hardest unit to find in all the plastic Soundtanks? Well it was. The complete series did come by more easily than i expected, but there were still a couple of the units that were a lot harder to find than others. My guess is that the number of manufactured units were correlating hard with the sales. Which also means that there are tons and tons of Thrashmetals, Power Leads, 60’s Fuzzes and Tubescreamers just waiting for you to grab them. While the less succesful units are getting scarce, one should still be able to source the Bass Comp or Autowah for relatively low prices. If one keeps him/her eyes open. I did finally get one. Don’t exactly remember what i paid for this, but it wasn’t too cheap. 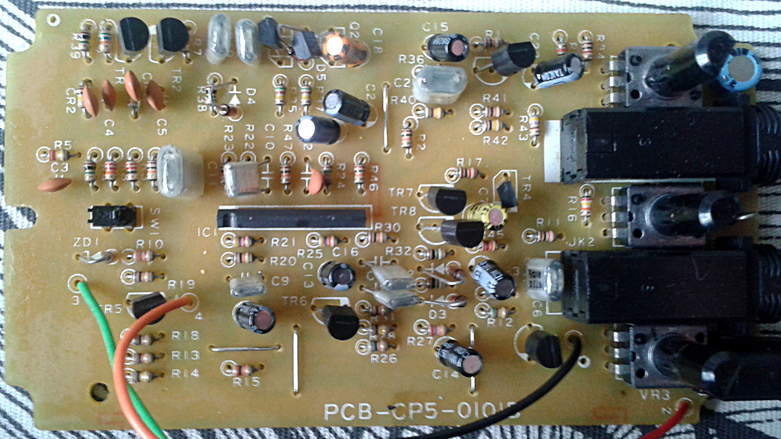 Once the bottom plate is out, the board looks exactly like the CP5, the guitar compressor from the same series. Once we take the board out to see it better, it is exactly the same board. Including the silk screened CP5 label. And if we look at these two closer, we see that there isn’t too much of a difference on the pedals. To be exact, the only change between CP5 and BP5 is one capacitor value. Sure. I knew about the differences before acquiring the unit, which may have been the reason i didn’t go for the ones that were out there with ridiculous price tags. So this is pretty much the same pedal as the CP5, CP10 and CPL. Well designed and well working BA6110 VCA-based compressor. I must wave a flag here. This is the last post about the plastic soundtanks for this blog. Yup. I’ve finally covered all of them. At the time of writing, there are still two metal cased units i’m on a hunt for. And those two are the original Thrashmetal (i’ve got three plastic ones) and the original Power Lead (i’ve got two plastic ones). If there is a difference between this unit and the CP5, i’m having real hard time hearing it. Not too noisy or mushy. I feel that the attack knob is rather useless, but that doesn’t make the rest of the features or sounds any less desirable. To sum it up, this is a poor man’s CP10. Defined and very usable unit. Superb thing with single coils. Haven’t played a lot with this on bass though. 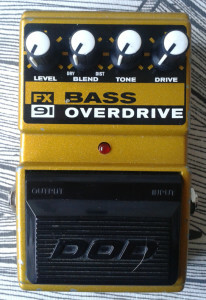 DOD FX91 Bass Overdrive from DOD FX-series. Made in US around year 2000. 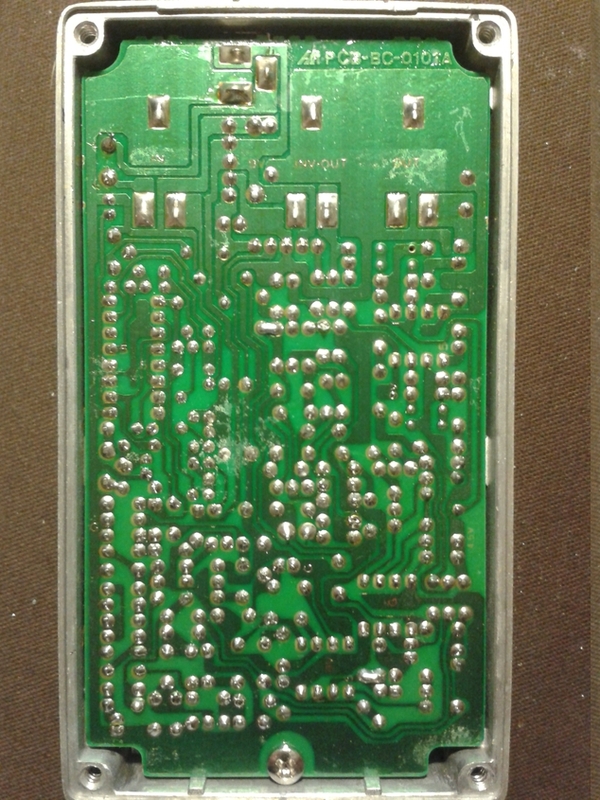 No serial or battery door in tact, even though this late enclosure version has the door attached with a rod. Bass overdrives are a fun genre. I’ve seen a few and nearly all of them are pretty standard overdrive circuits with no cut on the low frequencies. Which means that the designs may be slightly too fat for guitar, but i still think these should be tried on guitar too. America’s Pedal has some info about the unit. It apparently shares the circuit board with FX102 mystic Blues overdrive. There are more features for this version, which explains empty pads on both effects. 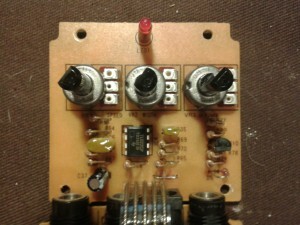 There is a schematic up on the web without the switching part. The drawing shows a buffer at the input, which passes the signal to pretty standard clipping amp and on to a Blend control which mixes the clean signal with the output of that clipping amp. That is followed by a tone stack and a recovery amp and a volume control. simple, but decent design. Interesting little fact about these units is that at least some of the units have a factory error. The R3 should be 1K resistor, but some units have a resistor with 200R value on its place instead. 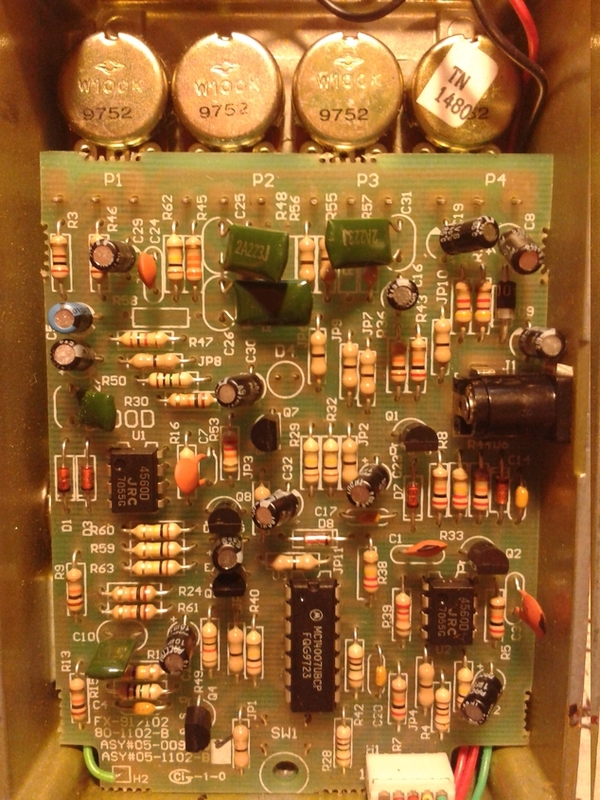 This change adds a noticeable amount of gain coming out of the clipping amp, and it shifts the frequency around too. You can read more about it at DIYStompboxes forum. Fat and useful. Serves well as bass overdrive and the blend control works also well. There’s enough gain to get soaring blast sounds out. I’ve played with this with a bass and a guitar. Bass is obvious choice to use this with, but it offers very nice boost features for a guitar too. Reasonably good effect. 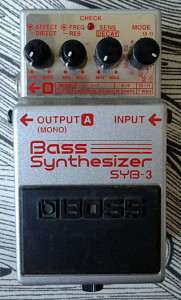 Boss SYB-3 Bass Synthesizer. Made in taiwan, september 1999. This is one of the pedals that have stayed with me for a long time. 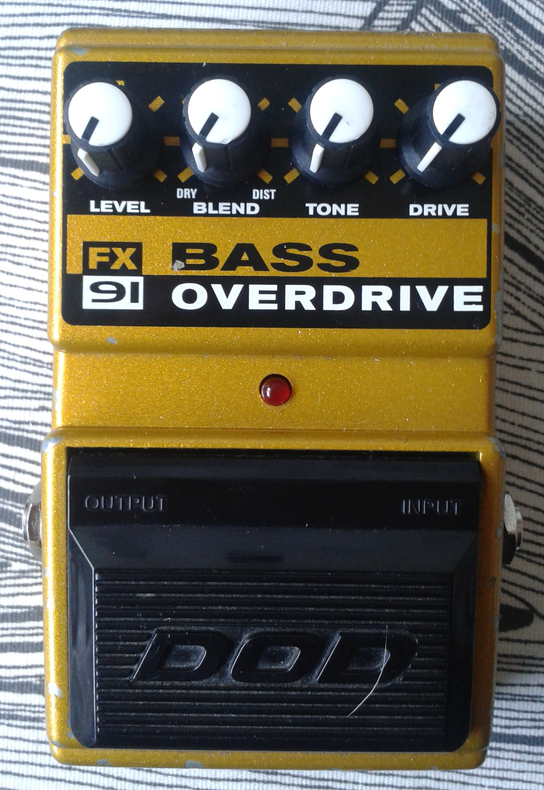 Got it somewhere around 2002 and i’ve used it mostly with a guitar with occasional bass hook when recording. Due to its very complex digital design, i won’t be able to break the design down. So i’m forced to leave you with an overview of the features and aesthetics. 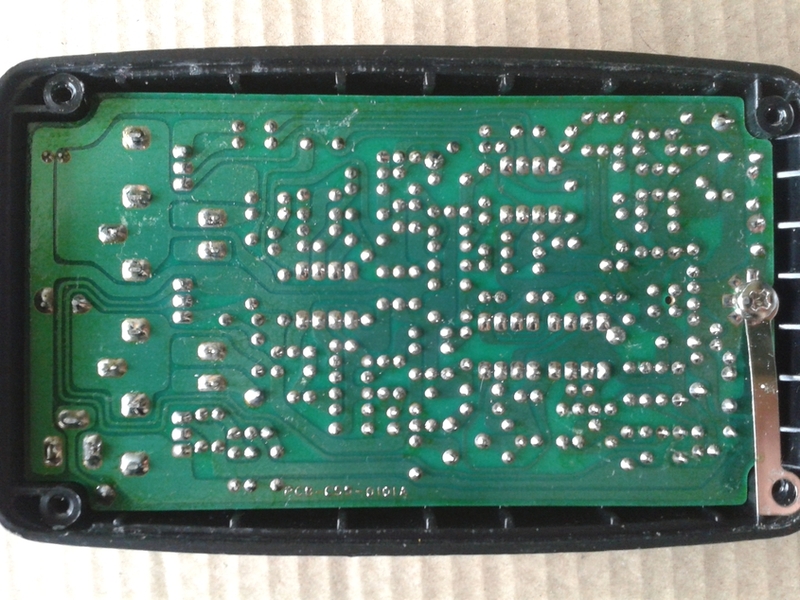 Opening the bottom plate reveals a two sided PCB that is pretty crammed. On the board design, there’s not much to mention. 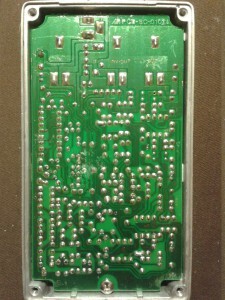 It’s your standard SMD-board with focus on functionality, rather than aesthetics. Like most Boss boards. I’d say it’s dull. Bottom layer is for caps and resistors. 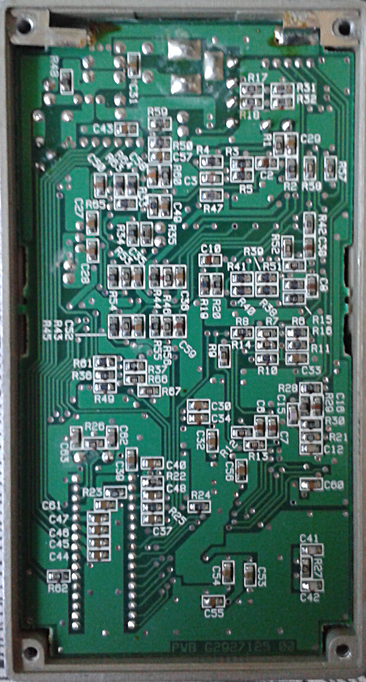 The upper sider has all the semiconductors. As you can see, the number is quite high. The reason for the complexity? Well. 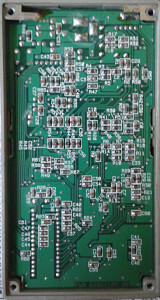 It has eleven modes, ranging from “internal”, made up digital synth-like sweeps to standard, clean autowah sweeps. As the controls go, there are individual level settings for clean and synth signals, which gives you the option of blending the signals the way you want – all wet being rather wild. 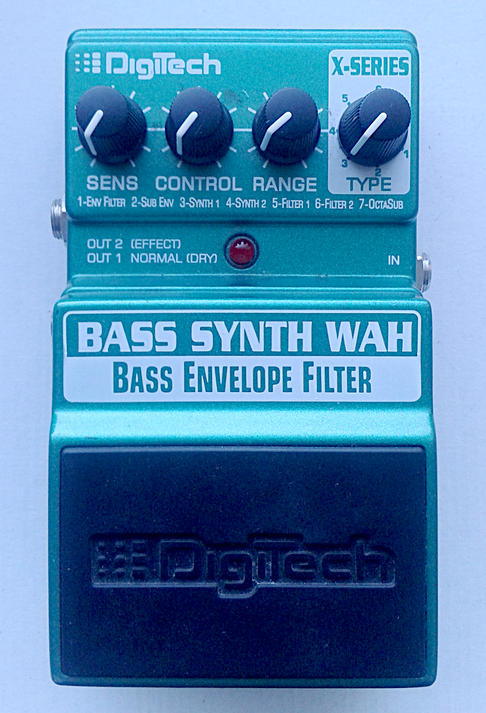 Next up is a very synth like filter with frequency and resonance controls. If there was one thing i’d like to see added to this one, it would be a expression pedal input for either of these controls. After these, there is sensitivity and decay controls that control how the trigger performs. Last control is 11 position switch that sets the effect type. Types are “internal” from settings 1-7. 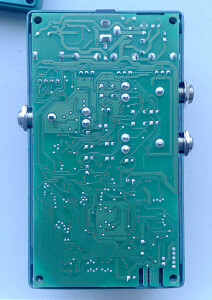 These are the programmed synt-like sweepers that are more or less unique to the pedal design. Settings 8-9 are “W-shape” modes, which are closer to standard autowah sounds than the internals, but still something rather odd. Last two settings are for “T-Wah”. So its safe to assume the last modes are digital recreations of ye oldee boss T-Wah autowah/envelope filter. Haven’t been able to play with original T-Wah, but something tells me these modes are a bit wilder or tighter than the ones found on the old analog pedal. Either way. There is a ton of versatility. I’d label this as one of the top ten Compact serie pedals. When Boss engineers take a design over the top, the results are still usable. Wicked. 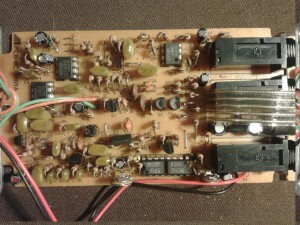 Extreme envelope filter on steroids. Wild filter sweeps with great, completely unnatural synth-style modes. Of course, there are milder autowah settings available, but it’s the wild ones that will roll your socks. The blend controls give the possibility of nice, subtle effects too. Very versatile and fun effect. Maybe the tones offered aren’t the greatest thing for your base sound, but for those hidden hooks and shock effects.. This is the right stuff. 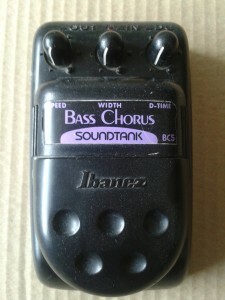 Ibanez BC10 Stereo Bass Chorus from 10/Power series. Made in japan around late 80’s. As with CS5/BC5 covered earlier, the circuit is more or less verbatim with CS10. Funny. Four pedals equal one design, or the other way around. And the colour is… Slightly darker-or-more-violet-than-SC10-blue. 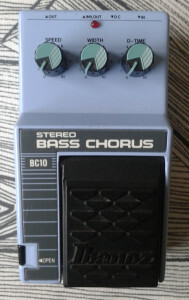 As with its guitary brother, SC10, the BC10 has also three controls. With, Speed and Delay Time. If i haven’t written it already, the controls stand for: Width – the intensity of the LFO sweep affecting the delay circuitry, Speed – this one is changing the LFO speed and Delay Time – affecting the length of delay getting swept by LFO and BBD clock timer. 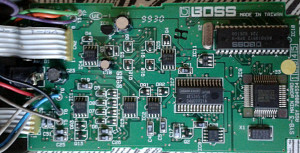 Modern board with modern traces. 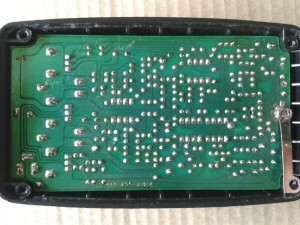 Very neat and professional soldering. The board size is not larger than what we find on Soundtank series, so it’s funny how the board here looks this crowded – even with LFO moved on the control board. Stereo output inverts the phase, so once again i’d recommend to try it as a stereo device. The component side says it all. 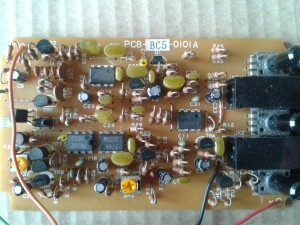 1:1 board to SC10 Super Stereo Chorus. Some of the cap values are different, but otherwise the design is verbatim. 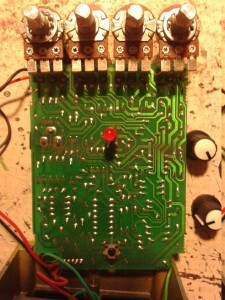 Upper board shows the LFO and controls. The controls are not complete workalike of SC10, with mild differences on the max speed and width. This may be diue to component tolerances and if so, the individual boxes of the same product will yield slightly different results. Damn i’m loving the analog circuits. 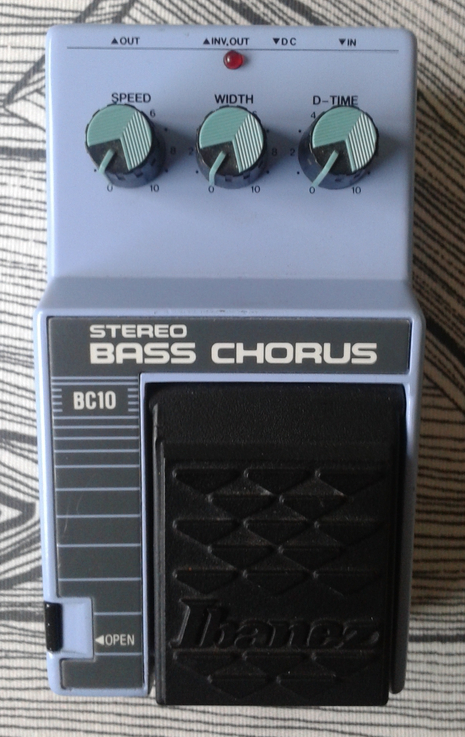 With the minor differences on the circuits, this one sounds and feels pretty much the same as SC10. Just slightly fatter. If i place all four of these in series (CS5, BC5, CS10 and BC10), the differences are very minimal. Which is interesting and fun. 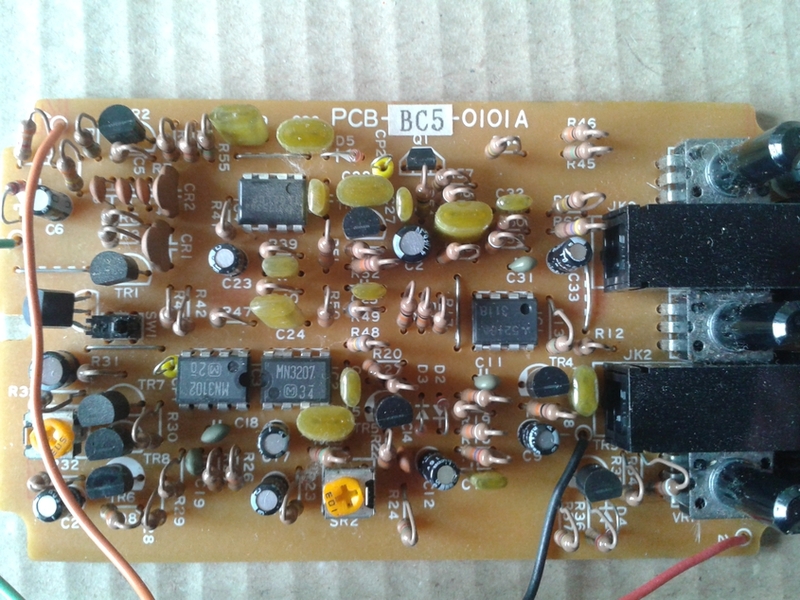 Maxon engineers could have just created one circuit, preferably the one found on this one (BC10) and use that board and design for all the rest. It sounds very good. Mellow, soft and fat(ish). Again, as with soundtank equilevant, the bass version lets more lower frequencies through, resulting in slightly softer sweep. Very good chorus to have. 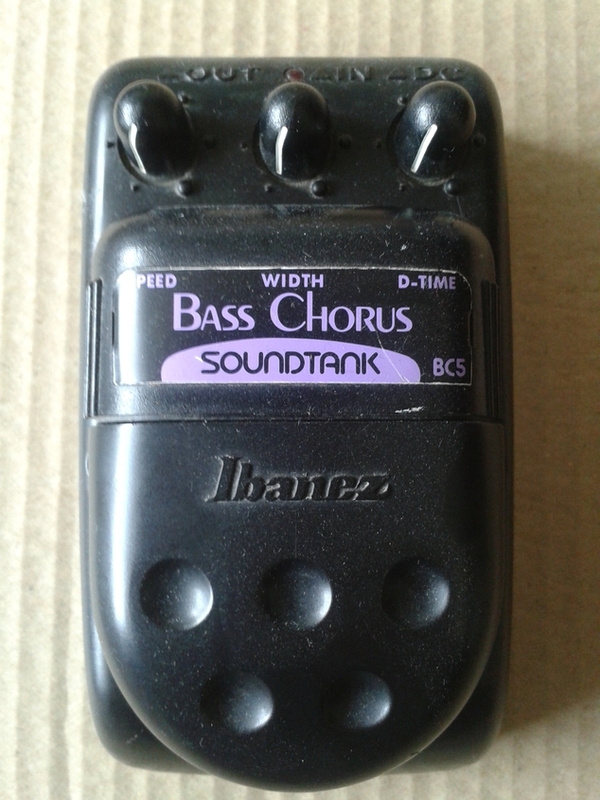 Ibanez BC5 Bass Chorus from Soundtank series, made in japan in mid-to-late nineties. Serial number is in millions, so it’s safe to assume this is late 90’s unit. To me it seems like the bass effects are mainly distortions, autowahs and lots of choruses. Bassists are left out on many things as most of the pedals are intended to be used with a guitar. For some reason almost every brand that sells guitar choruses also sell bass choruses. The difference between the two? Mostly just a cap job to let more of the lower frequencies through. There are couple of pedals in Soundtank series that are like broters and sisters. Reverse the colours on the top label and swap couple of caps. That’s it. Take a look at the board. 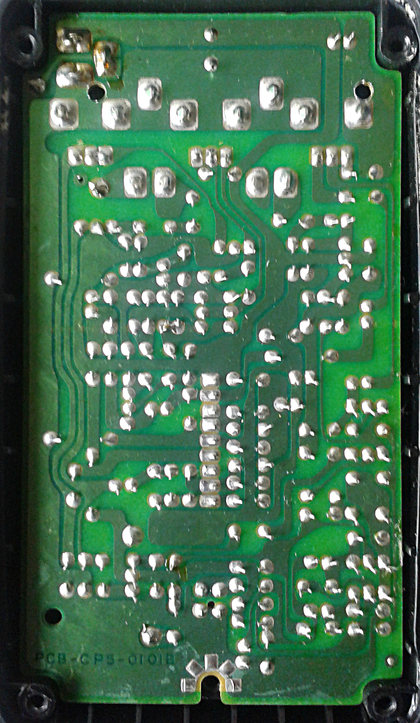 It clearly has CS5 marked on the solder side. 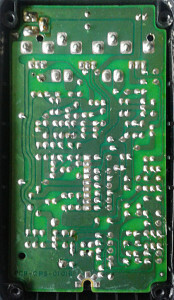 Although the board doesn’t look like the board on CS5 (that i covered very recently), it is the same board. 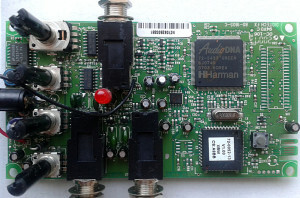 The picture below shows that Maxon used the same boards for both units and replaced the label with a sticker – as seen on Soundtank SF5/FZ5 (that i covered a lot earlier). The components used are different. 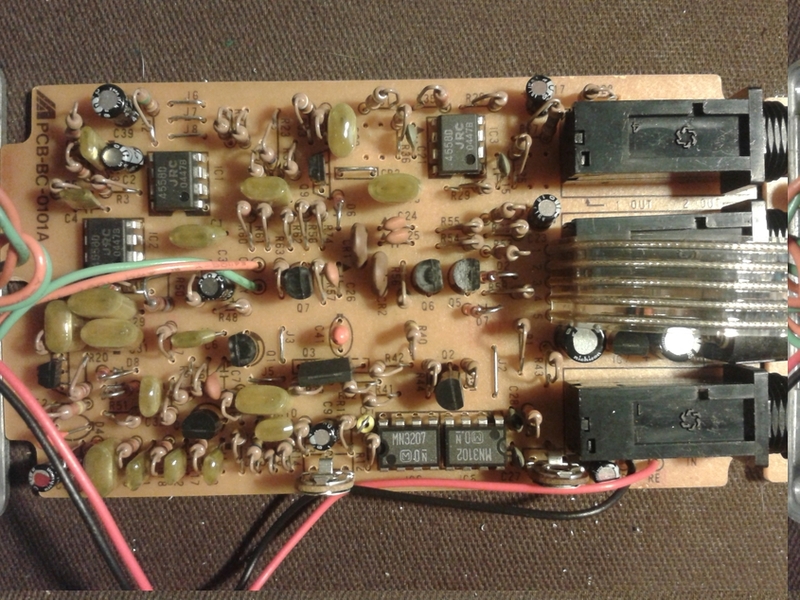 Where my specimen of CS5 has 1/8W resistors mounted axially, the newer board labelled BC5 has 1/4W resistors. The traces do not look alike. Those look much more modern on this unit, which makes me think that this is just newer unit than my CS5. Topologically BC5 and CS5 are the same circuit. Some of the values may be altered, but i couldn’t find a schematic to confirm. And yes. I’m just too lazy to check this units component values against CS5. May it be whatever. These are well built units with lots of user value left in them. Swap the switch and you’re good to go. If there is any difference between BC5 and CS5, you’ll need to focus if you want to hear it. In fact i placed both pedals on my desk, tuned the delay time, width and speed to match each other and played away. Pressed both switches at the same time with indicator lights not visible to me. One out of every three times i guessed wrong which unit was active. The bass version sounds probably a hint thicker and fatter, but that’s it. The units are basically identical. So this might even be better for guitarists who want the fat with their cold , haunting gothic chorused guitar leads. Entries (RSS) and Comments (RSS). 42 queries in 0.150 seconds.